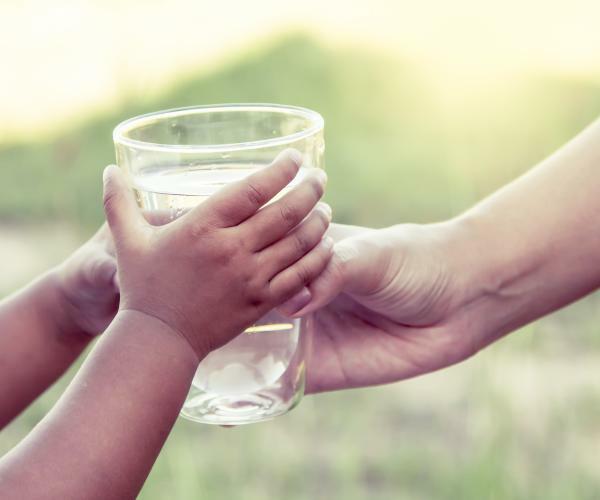 Warmer weather and more sunshine mean school field trips and athletic days aren't far ahead, and this means children are once again at risk of dehydration. When they're busy, it can be tough to get them to drink enough water. To make sure they get enough liquids on busy school days, parents can offer some fun alternatives kids will love. Water can be boring when compared to soft drinks and juices, so spice it up. By freezing whole fruit such as berries or citrus fruits, and adding them to your drinking water, you will keep the water cold and give it a fresh flavor. There are other options, too. Vegetables like cucumbers and spices can make water into the perfect lunch beverage. Edible flowers like nasturtiums, pansies, roses, and violets look elegant in clear water containers. Just be sure to filter the water to get rid of any cloudiness or contaminants. Sometimes, children don't realize they haven't had enough water. Parents and teachers can easily solve this with a permanent marker. First, determine how much the bottle holds. Then, mark out lines every seven ounces or so and fill it with fresh, filtered water. Tell them that's how much they should drink every thirty minutes on hot days. Doing this also helps parents know they've sent along enough water for the day's activities. Parents don't have to limit their children to just filtered water. Fruits and vegetables can help give kids a little extra hydration and an important energy boost. Watermelon, strawberries, oranges, and pineapple all have high water content. For lunch, include a salad or taco salad consisting of lettuce, celery, tomato, and green pepper for a healthy liquid boost. The kids will love sharing them with their friends or dipping them in a healthy sauce. Keeping kids hydrated when they're busy with school activities can be difficult, but it's not impossible. Start with a high-quality freshly filtered water. Then, get the kids and have fun preparing the fruits and vegetables. They'll enjoy the special touch, and parents will love knowing their child will be healthy and hydrated while they're away. At Friendly Water, we offer a wide range of drinking water filtration solutions, so your family has the best quality water you deserve. Contact us for a quick quote today. Which Drinking Water Filter Type is Best for the Job?